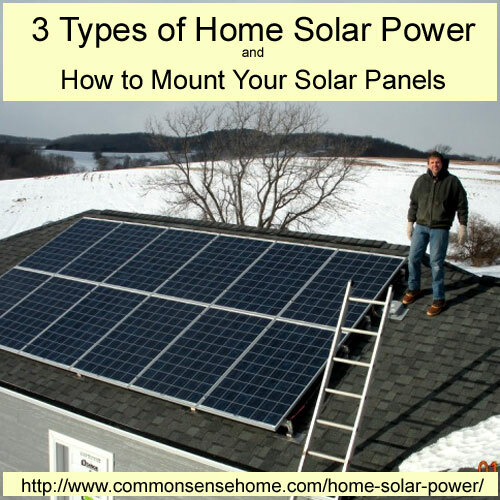 This is a guest post by Jerry Noel, explaining three types of home solar power projects and how to mount your solar panels. In Part 1 (Solar Electric Basics), Jerry discussed the three predominant questions of solar power: cost, batteries, and “DIY”. Part two provided Emergency Power Options. The three types of home solar power projects are grid connected with no batteries, grid connected with battery backup and off grid. Approximately 95% of all systems installed in the last 5 years are systems connected to the grid without battery back-up. These are the cheapest and easiest systems to design and install. You are using the electrical grid as your ‘battery’. If you need power, you draw it off the grid as before. If you are producing more than using (like during the workday on a sunny day) you export the excess power back to the grid. Depending on your utility, you will get a credit back for your excess production. Their main disadvantage is that when your grid power goes out, you also are without power. By law, inverters must disconnect from the utility grid within 2 seconds when power is lost. Utilities have monitors scattered around their grid. When they sense an outage, crews respond to that area. If the sensor detects you sending power back to the grid, it can be confusing and delay response time. It can also endanger the lives of the linemen working on the poles. These systems are connected to the grid just like the other ones, but also have batteries to provide storage to be used during an outage. When your batteries are fully charged, all excess power will be sent out to the grid as before. During an outage, the batteries will run your critical loads until either the power comes back on or the batteries run dry. These are the most complex and expensive. People that have these systems usually have specific needs like medical or professional. In addition to the batteries, a separate electrical panel for the critical loads also needs to be installed. The designer must also determine how much power is required, and for how long to properly size the batteries. A small generator may also be added to replenish the batteries during prolonged outages. Off grid systems are ones where people are not connected to the electric utility. They create, store, and use all their own power. They need to know exactly how much power they require and how much access they have to the solar resource (the sun). They usually have made the complete conversion to LED lamps, gas appliances, dimmers, timers, etc. Some even have gone to the extra expense of purchasing appliances and lamps that operate on 24 or 48 volt DC to save on the conversion losses of going through the batteries and inverter. These systems tend to be on residences in remote areas where getting power brought in by the utility could costs many thousands of dollars. Going “off grid” in the middle of a metropolitan area is quite bluntly: FOOLISH! Either that or they have an extra $20,000 to spend just to give a “1-finger salute” to the utility. My opinion is that you save the money and make the utility be your battery. 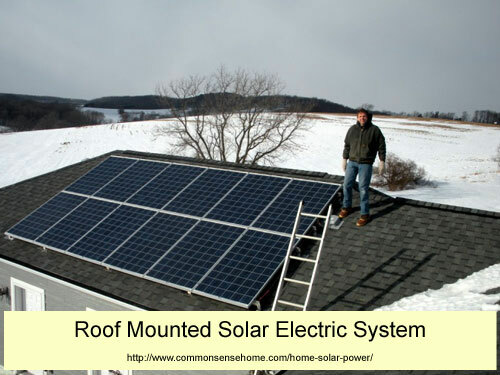 Most home solar power panels are mounted directly to the roof of a building. Some are on posts, either as a fixed array (not moving) or as sun trackers. Finally, some may be mounted on a framework on the ground. On the top is a traditional roof mounted system. This one is 2.5 kilowatts. The one on the bottom is a ground mounted, fixed tilt array, 5 kilowatts. Both were installed by Top Hat Fireplace & Solar of Baraboo, WI. Roof mounted is good if you have a southern facing roof, +/- 10° of true south. The best tilt angle for fixed arrays is your latitude minus 10°. 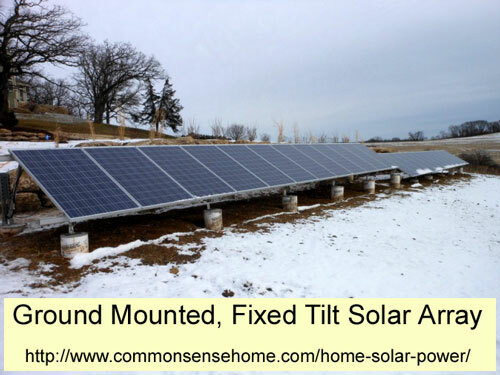 Solar thermal arrays need to be tilted up in order to absorb more sun during the colder months when the sun is lower in the sky. Solar electric functions better in summer, so we sacrifice the smaller winter output. Roof mounted systems are relatively inexpensive to install. They put the array close to the inverter thus a smaller wire size. If your roof angle isn’t a perfect 35°, don’t worry. If your system is within the window of 25° to 45° your system will operate within 5% of ideal. Adjusting the tilt away from parallel to the roof will add extra stress from the lifting effect of the wind. Sun trackers come in two styles, single axis and dual axis. A single axis tracker has a fixed angle in relation to the ground, but can pivot along their center axis to follow the sun from east to west. They can be manually adjusted for different angles for seasonal requirements. 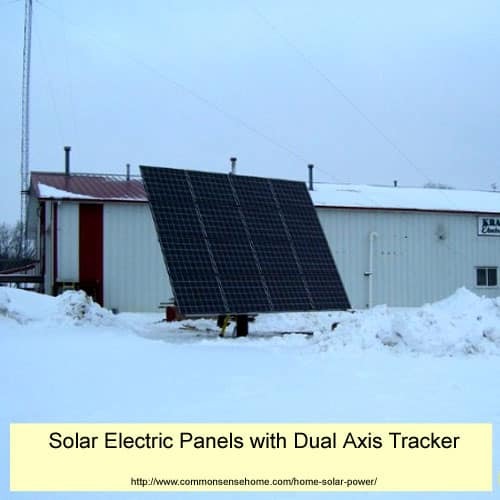 A dual axis tracker (as shown in the photo of the one outside the office of Krantz Electric) is the style we normally think of when talking about trackers. They follow the sun across the sky and adjust daily for the changing angle in the sky, from high in summer to low on the horizon in winter. Regardless of style, trackers are only effective where you have a wide open horizon from sunrise to sunset. There are two methods of “tracking” the sun. One such as used by DH Solar uses a computerized method that uses the known arc of the sun and aims at that point and adjusts every few minutes. The other, as used by Wattsun Solar, uses a sun sensor that will aim the panel at the bright spot in the sky. This may cause the array to point away from the dark cloud covering the sun and pointing to what it senses as the better source. I have no preference to either system; both are effective ways to accomplish the same effect. As always, be safe. Hire a licensed professional before trying to play with electricity – it can and will kill you. For more detailed home solar power information, check out the Solar Electricity Handbook – 2013 Edition: A Simple Practical Guide to Solar Energy – Designing and Installing Photovoltaic Solar Electric Systems . This is a guest article by Jerry Noel. Jerry is a Wisconsin Master Electrician and a NABCEP Certified solar installer. NABCEP is a voluntary credential, considered to be the cream of the crop for renewable energy professionals. NABCEP stands for North American Board of Certified Energy Practitioners. Currently,Jerry is a foreman for Krantz Electric in Verona, WI. They are located a few miles to the south-west of Madison. Krantz Electric does residential, commercial and solar electric projects. In the past, he has taught solar electric theory and installation for the IBEW , Midwest Renewable Energy Association, and Solar Energy International. Please visit the Krantz Electric website for more information. Over the course of upcoming posts, he will do case studies using our old house (they just moved) and their new house to give you a more in depth feel for what is required, how it is put together, and possibly the costs involved. DSIRE is a comprehensive source of information on state, federal, local, and utility incentives and policies that support renewable energy and energy efficiency. Established in 1995 and funded by the U.S. Department of Energy, DSIRE is an ongoing project of the North Carolina Solar Center and the Interstate Renewable Energy Council, Inc. Visit DSIRE now. Energy rates in my area are going up in my area and my wife and I have been thinking about going solar because of that. I have been looking into the different types of solar panels and think that it is very cool that there are solar panels that will track the sun to have maximum efficiency. I have only seen fixed ones before, so this is very interesting to me.